Thank you for taking the time out of your busy life to come to my website and check out this report, and I invite you to check out the other articles I’ve published on a wide range of health problems. I am certain that you will be very happy that you read this report, as it is full of very useful information to help you free yourself once and for all from the painful grip of worry and anxiety about Swine Flu. 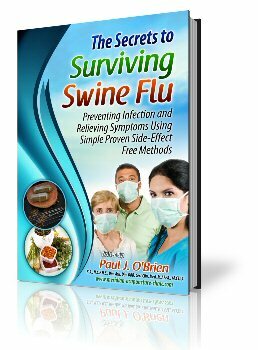 Furthermore, it is full of helpful tips and tactics to boost your immune system and prevent you from catching seasonal and Swine Flu. In the report I explain EXACTLY what the Flu is, how it works and what is being done about it in terms of conventional medicine. Unfortunately as you’ll soon see, it’s not good. Rest assured I am not engaging in fear mongering or in exaggerating any claims. Everything you will read in the report about the horrible side effects of the drugs that are being prescribed is true. All statements are supported with the relevant studies found and listed in my footnotes. The good news is there are proven, simple and effective alternatives I explain everything in the report. I’ve listed recipes to boost your immune system and clear the symptoms if you’ve already caught this Flu and give you practical advice on what steps to take to ensure you stay healthy. I encourage you to remove any distractions for the next few minutes and give this report your full attention, as it may just contain the solutions you’ve been looking for to develop a stronger immune system and robust health. In this special report, I am going to share with you 3 all-natural, safe, and very effective ways that you can use to dramatically improve your immune system and physical wellbeing. Each of these approaches has been carefully studied and have been empirically shown to reduce or eliminate infections of influenza, colds and flu’s just as effectively, if not more effectively, as pharmaceuticals do without any side effects.